Whistler, a former logging town located in the south-east of British Columbia, is now primarily known as North America’s largest winter skiing and outdoor sports destination. Home to both the Whistler and Blackcomb Mountains, vacationers return again and again for the massive alpine bowls, superb ski runs and expertly groomed slopes. 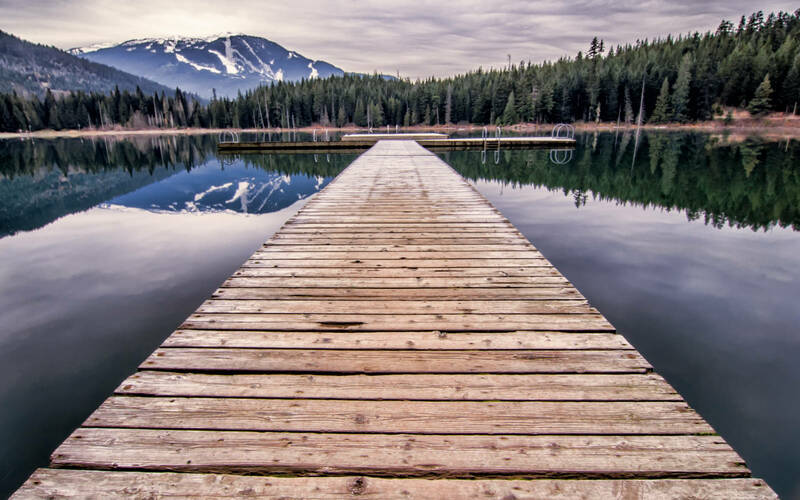 Part of what makes Whistler so attractive to vacationers is its easy accessibility. Located just 2 hours from Vancouver, the Sea to Sky Highway connects this idyllic village to the rest of the world, and the spectacular drive is part of the experience. Additionally, the journey from Seattle, Washington takes just 5 hours. Apart from the celebrated skiing, snowboarding, skating and snowshoeing facilities, Whistler also offers a broad range of other activities to keep everyone happy—whatever the season. Rock climbing, hiking, and mountain biking are all popular thanks to the unique scenery and challenging terrain. If all that sounds a little too extreme, then you can also just kick back and relax with a round of golf or enjoy a broad range of water sports during the summer. Whistler Village lies at the base of the mountain and offers a lively atmosphere with a variety of restaurants, bars and cafes. A selection of shops and galleries also give you a chance to take a little piece of this unique part of the world home with you. Finally, if you are looking to unwind in style, then the numerous spas set against the spectacular mountain ranges ensure you have well looked after. Welcome! Enjoy all that that Whistler has to offer. Enjoy Olympic grade ski and snowboarding runs or experience Outpost Whictler! In cooperation with local businesses, we are proud to provide the following activity lists. Population: 9,248 permanent residents as of 2006. Accommodations: 115 hotels / condos / B&B’s offering more than 8,400 rooms. The Brewhouse Pub offers a personalized tour of their microbrewery every Wednesday and Saturday at 3:00pm. Call 604.905.BREW. Check out the new Whistler Brewery and sample the fare in Function Junction. Whistler Cooking School offers a variety of cooking classes from beginner to advanced in a state-of-the-art kitchen. Call 935-1848. Expressions “You Paint It” Ceramics offers everything you need to paint your own mug, plate, etc. Call 604.932.2822. Lotus Art Supplies provides beads and thread – all you need is a little imagination to make your own beaded jewelry. Call 604.938.0055. Snomotion can help you design your own Whistler t.shirt or other logo.wear. Call 604.932.2550. Meadow Park Sports Centre: 604.935.PLAY. Armchair Books offers a variety of books, magazines and newspapers. Call 932.5557. Whistler Public Libraryoffers a variety of books, videos, magazines and newspapers. Stop by on Friday mornings for their pre.school children’s program. While you’re there, surf the internet and send your friends an e.mail free of charge. Call 604.932.5564. Whistler Museum & Archives provides an interesting look at the history of Whistler. Open Thursday to Sunday. Call 604.932.2019. Great Wall Underground, Whistler’s Climbing & Guiding Centre Call 604.905.7625. Rainbow Theatre features new releases twice daily. Located in the Whistler Conference Centre. Call 604.932.2422 for show times. Whistler Racquet and Golf Resort offers three full-size indoor tennis courts, as well as weights/cardio equipment. Racquet Sports, Fitness & Strength Training, Racquet and ball rentals. Call 604.932.1991. Shop Whistler’s collection of shops and boutiques to find unique souvenirs, clothing, jewellery, gifts, arts & crafts, sporting goods and Whistler logo.wear. Check out the local papers for all the latest in community news and entertainment listings. Pick up The Question or The Pique newsmagazines or listen to local radio, Mountain FM 102.1. Check out your Tourism Whistler map for trails. We’ve hiked most of them, and we’ll be happy to point you the right way. Lakeside Park on beautiful Alta Lake offers Canoe, Kayak, Peddle Boat hire by the hour. Want to go fishing? No problem we can supply all the gear. Want to see the best views Whistler can offer? Paddle with us down the River of Golden Dreams . eco.adventure, excitement, wildlife, for everyone. Guided or unguided trips available. 7 great courses in the area. 3 championship courses in Whistler and 4 within a 60 minute drive. Great deal at The Meadows in Pemberton. Outpost Whistler guests are given a special rate of $40 per round plus taxes. Ask Outpost Whistler for details or visit Pemberton Golf. With over 100 kms of trails, from 6,000 feet to the valley! Ski ¨C Board ¨C Cycle: Rentals ¨C Repairs ¨C Retail! Top brands in Valley Trail to Bike Park Cycle equipment available! Free Helmet, Map and Locks with Every Rental! Complimentary First Flat Tire Replacement on Downhill Bikes! A fun outdoor course set up at the base of Blackcomb. Many of Whistler’s trails, and much of the Valley Trail, are rollerblade.friendly. Ride a cart down a luge-style track on Blackcomb Mountain! Fun-filled days for the kids, and a vacation for the parents! A number of possibilities, from tranquil to extreme! Take advantage of fantastic stay and ride packages including three nights accommodation plus two days in the Whistler Mountain Bike Park for only $192 CAD/ $169 USD** per person. Two-Night / Two-Round Golf Packages start at $337 CAD/ $297 USD** per person for two nights accommodation and two rounds of golf at any of the four pro.design courses. Play with some big toys! We’ll set it up for you and save you hassle. Cougar Mountain awaits! We can set these up for you as well. Offering our guests the best service with free delivery, in-room fittings, and slopeside service. Ask about discounted lift tickets, equipment rentals, heli skiing, snowcat skiing, winter activities, ground transportation and current specials. Weddings – we can set you up with a wedding planner, marriage commissioner, photographer, accommodation, and venue options. Corporations, large groups, conferences, schools – Contact us directly for discounts!